Sometimes you just want to make something small. My quilty friend Laura @littleandlots mentioned a couple of months ago that she didn't have a handmade mug rug (what?!?!) so I started scheming one up just for her. The perfect moment arrived when her Sisterhood of the Traveling Quilts bee blocks stopped at my house at the end of March. 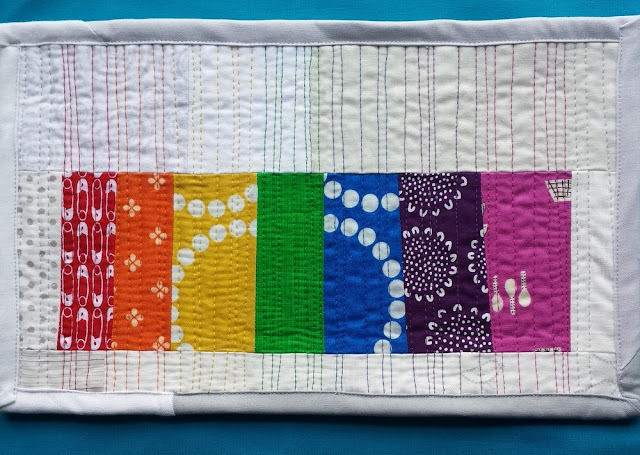 Laura LOVES rainbows, Lizzy House fabrics, and low volume, so I used scraps to play with those ideas. I love how the Pearl Bracelet fabrics interact with each other (that placement was unplanned!). Then, I went to town with different colors of Aurifil thread to highlight the rainbow. I was afraid the thread would invite too deep of a contrast but I was thoroughly pleased with the results. I love quilting organic/non-straight lines with my free motion foot. There are times when it makes sense to use a walking foot, but, if you've developed the control, an FMQ foot works especially well for small projects! P.S. can you find the bird in the above photo? 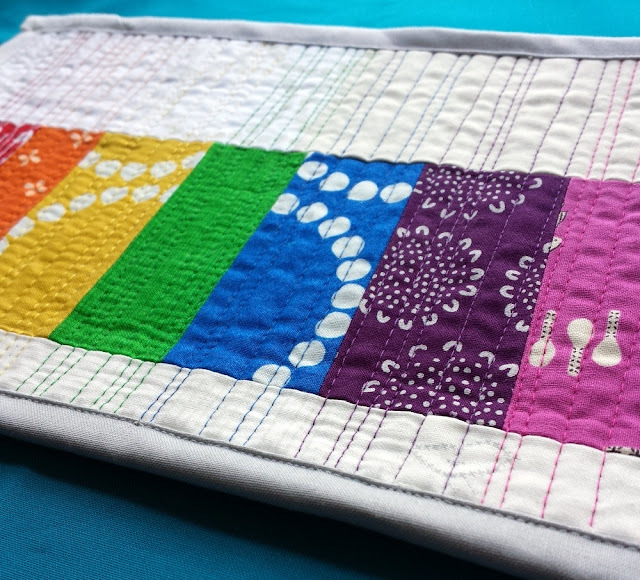 The mug rug/mini quilt was begging to be reversible and I thought the rainbow threads would have a muddying effect on the back. I know most quilters match their top and bobbin threads, but I often don't. I took my time and the colors didn't show through. I also made sure my tension was juuuust right. Is it because I'm entirely self-taught that I just don't care about most of the "rules?" 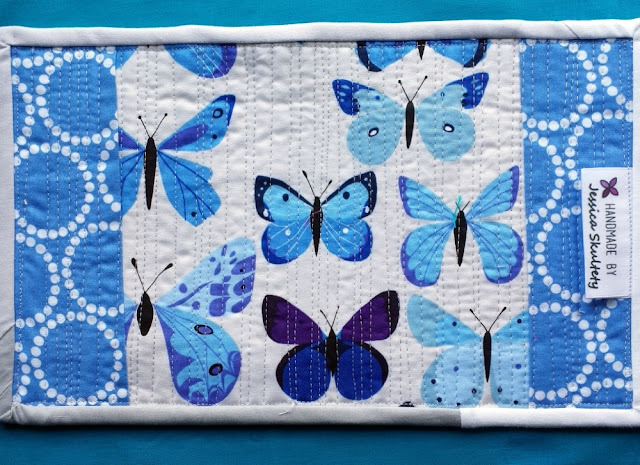 Do what makes sense for your project and don't worry about the quilt police! Hopefully seeing a rainbow through the gloom (at least, that's what it's like here in NJ) will bring some color to your Monday! Aww this is the greatest mugrug for Laura! Great choice of fabrics, and I love the colored thread! Great mug rug for Laura!!! How sweet! I love that you paid attention to that comment and made this so personalized for her! I didn't find the bird! I love your mug rug for your friend! I rthink it is absolutely perfect. Quilt police be damned!